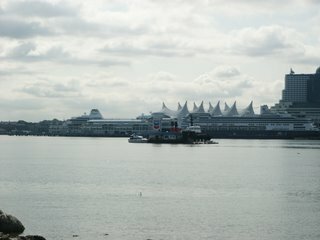 I recently went to Vancouver for the annual meeting of the Society for Mathematical Psychology. It was quite an adventure: even upon flying in there, we could see the snowy Mount Reinier from the airplane. Then flying in Vancouver Bay is absolutely stunning. Vancouver is a quite dramatic city: beaches, mountains and a big city all in one. It has lots of Japanese immigrants, hence sushi is a very popular food and I ended up eating sushi pretty much every day! The conference itself was also quite wonderful - I enjoy these conferences with relatively few attendees. There were some good talks about mathematical psychology and the brain, including great talks by Greg Ashby and Mike Shadlen who come from two opposite directions: Mike Shadlen starts from single neuron firing in monkeys during a decision making task, Greg Ashby starts from box models of the human brain about categorization and works his way down to the neural level, using fMRI. The brain is just so hard! 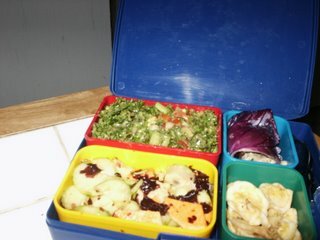 In the recent days I have been experimenting quite a bit with raw food, and one example of those things are some nice raw lunchboxes I created, of which I have pasted a picture here as well. It's quite an adventure. One extremely helpful resource is Karen Knowler's weekly eZine with lots of good articles and tips. What I like about it is that it's a very fast and also quite healthy way of eating, even though I do not think at this point that eating 100 % raw is a great idea. But more raw and unprocessed food is definitely good, and especially because it seems to reduce my cravings for sugar-heavy foods, which is really the main goal.